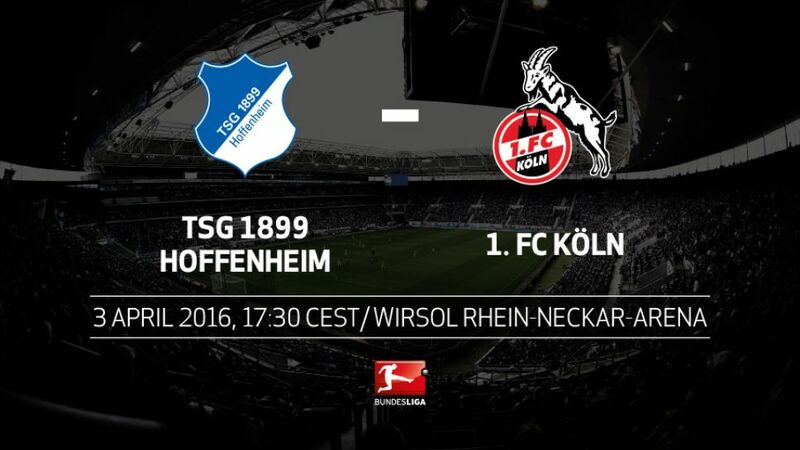 TSG 1899 Hoffenheim will look to continue their upward trend when they host 1. FC Köln on Sunday (17:30CEST/15:30GMT). The Sinsheim club moved out of the bottom two and into the relegation play-off spot with victory over Hamburger SV on Matchday 27, and can make it three wins on the bounce with three points at home to Köln. Julian Nagelsmann has instilled welcome belief in the Hoffenheim ranks, but the Bundesliga's youngest-ever permanent head coach will not need reminding that the mid-table Billy Goats - aside from being one of the top flight's most stubborn outfits - are themselves in need of points to tie up their place in the division for another season. Hoffenheim have amassed 13 points in seven matches under Nagelsmann. Only FC Bayern and Borussia Dortmund have picked up more in that time.Hoffenheim last won three Bundesliga matches in a row in 2010 when Ralf Rangnick was in charge.Köln have only nine points to show for their ten Rückrunde matches so far, but did post wins over bottom two sides Eintracht Frankfurt and Hannover 96.Köln head coach Peter Stöger celebrates his 1,007th day at the helm on Matchday 28.Hoffenheim's Cologne-born striker Mark Uth has scored three of the club's six home goals on Nagelsmann's watch.Köln have lost only one of their last eight away games - the Matchday 22 Rhine derby against Borussia Mönchengladbach.Hoffenheim have lost all five of their games played on a Sunday this term.Former Hoffenheim striker Anthony Modeste had seven efforts on goal in the reverse fixture but failed to find the net.Hoffenheim and Köln are the only two Bundesliga teams not to have scored a long-range goal this season.